This is the best subcompact crossover for you if style reigns supreme on your shopping list. Mazda’s entry-level SUV gets even comelier for 2019, with a new grille, tallamps, and wheels to complement an interior revamp that introduces full leather upholstery. The CX-3 debuted for model-year 2016 to rival the likes of the Subaru Crosstrek, Jeep Renegade, Chevrolet Trax, and Honda HR-V. This five-seat hatchback is essentially a Mazda 2 subcompact car with an elevated ride height and available all-wheel drive (AWD). Mazda doesn’t sell the 2 in the SUV-crazed U.S., determining instead that using it as the basis for a crossover would allow it to add a few thousand dollars to the price. And because the Japanese automaker doesn’t heavily incentivize its vehicles, the CX-3 could still be a moneymaker even if it wasn’t very popular. No doubt the CX-3 is selling better as crossover than it would have as a car, but demand is still weak. Mazda sold 16,899 during 2018, a 3-percent increase for the year but still not enough to crack the top 10 in a class of some 17 competitors. The CX-3 looks great and drives well but its pricing tends to track a bit higher than the segment average. And in top Grand Touring trim, it steps on the toes of Mazda’s compact-class CX-5, a crossover that’s roomier, more powerful, and just as much fun to drive. Should you buy a 2019 model or wait for the 2020? The only reason to wait for the ’20 would be to see if Mazda makes its full suite of driver-assistance features standard on all three CX-3 model grades. For 2019, lane-departure warning with automatic steering correction, high-speed autonomous emergency braking, radar cruise control, and automatic high-beam headlights are standard on the top-line Grand Touring and optional at around $1,000 on the base Sport and midrange Touring models. 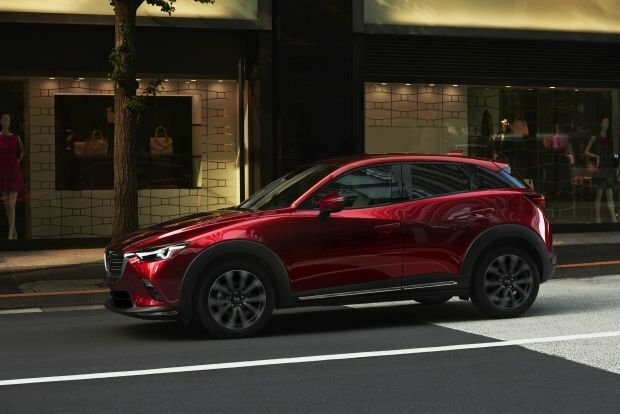 To Mazda’s credit, the 2019 Sport and Touring do come standard with blind-spot and rear cross-traffic detection, as well as a basic form of automatic emergency braking that can bring the CX-3 to a complete stop at speeds up to 19 mph to avoid a rear-end collision. Otherwise the 2020 CX-3 should carry over the model-year-’19 styling and feature changes, including drivetrain tweaks designed to make it more responsive in everyday commuting. It’s almost certain to cost more, though, and it could have a relatively short shelf life: a fully redesigned CX-3 is in the works for model-year 2021 or ’22. 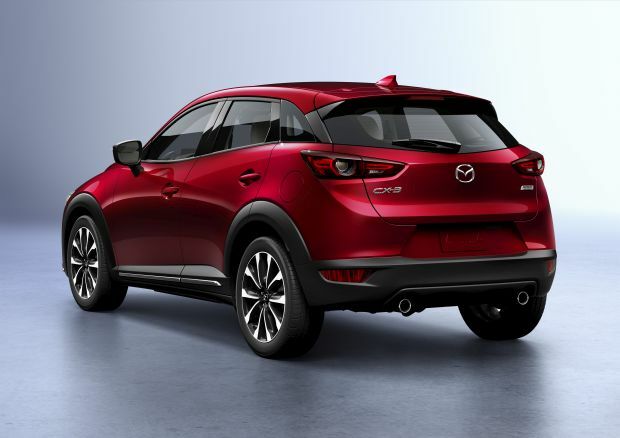 Styling: Mazda designers are penning some of the finest looking vehicles on the road, and CX-3 is no exception. For 2019, the exterior sees a few changes in the form of a new grille, updated wheel designs, available piano black and chrome accents, and revamped taillights with LED illumination. Sharp angles are the current trend in car design, and this vehicle has its share. CX-3 deftly balances them with flowing cut lines that arc smoothly across the body sides in a wave-like pattern that mimics the wings of Mazda’s logo. It’s a neat design touch that adds a level of sophistication we don’t normally see at this price point. The story isn’t quite as positive when you enter the CX-3’s cabin, where function takes a (cramped) back seat to form. As with the exterior, the interior design is a visual and tactile delight. Model-year 2019 sees the addition of a dashboard panel trimmed in faux suede, which complements other nicely textured materials. Grand Touring models gain full leather upholstery, replacing the leather/imitation suede blend available on the 2016-2018 CX-3. Sport and Touring grades continue with cloth and a fabric/leatherette blend, respectively. Instrumentation places a large tachometer dead ahead of the driver. Speed and fuel levels are digital readouts. The look is sporty for sure, but we would like a bit more customizability, including an engine temperature gauge instead of a single light on the dashboard that turns off when the vehicle reaches operating temperature. A redesigned center console sees the addition of an electronic parking brake. There’s a bit more storage for small items than in the 2016-2018 model, but the center armrest still hovers over one of the cupholders, which limits the height of beverages you can put in it. Climate controls consist of three large, rotary dials, which are easy to manipulate without taking your eyes off the road. Less intuitive is the infotainment system. It uses a 7-inch display, which you can control with a console-mounted joystick/knob that’s flanked by buttons a-la BMW iDrive. For 2019, Mazda added touch capability, which makes navigating the various menus much simpler in some cases. It also paves the way for Apple CarPlay and Google Android Auto support. It was not available at launch of the 2019 CX-3, but the company has promised to roll out software updates to support these two smartphone interfaces. Passenger space is OK up front. Legroom is decent, but headroom gets cramped beneath the housing of the power sunroof that’s standard on the Grand Touring and optional on the Touring. CX-3 is a comparatively short vehicle, and its high belt line will make you feel a bit submerged as opposed to the tall driving position you’ll experience in most other subcompact or compact SUVs. The back seat is very tight. Even moderately sized adults will have little legroom when situated behind another person of similar height. Cargo capacity is also near the bottom of the competitive set with 12.4 cubic behind the rear seatbacks and only 44.5 with them folded. Mechanical: CX-3 reprises a 2.0-liter four-cylinder engine for 2019. Internal updates have increased horsepower to 148 from 146. Torque remains the same at 146 pound-feet, but Mazda says it’s accessible across a wider engine speed range. The ’19 model feels slightly quicker from a stop and when executing high-speed passing or merging maneuvers. A Sport mode toggle switch quickens throttle response. The sole transmission is a 6-speed automatic, which seems out of step with rivals that offer 8-speed and continuously variable units, but it works just fine in the CX-3. All models have a useful manual override on the center console, and Grand Touring grades add steering-wheel paddles. Its model-year ’19 update would have been a prime opportunity for Mazda to improve CX-3’s NVH (noise, vibration, harshness) performance, but sadly, it still comes up short these areas. The engine is rather loud at idle and when accelerating, and it never fully quiets down at cruising speeds. All grades come standard with front-wheel drive, but 90 percent of CX-3 buyers choose the optional all-wheel-drive (AWD)system. Mazda’s implementation benefits both dry- and wet-road handling, so we think it’s worth spending the extra $1,400. Touring and Grand Touring grades have 18-inch wheels, which supplement excellent steering feel and minimal body lean in fast turns to make CX-3 arguably the most entertaining subcompact crossover. The tradeoff is a ride that’s stiffer than what you’ll find on rival vehicles. CX-3 Sport models have 16-inch wheels, so they’re more compliant over bumps while sacrificing little to handling prowess. Features: The Sport is well equipped for a base trim level. In addition to the usual complement of power accessories and a rearview camera, they include keyless entry with pushbutton engine start, blind-spot alert with rear cross-traffic detection, and a basic form of automatic emergency braking that can bring the CX-3 to a complete stop at speeds up to 19 mph to avoid a rear-end collision. Touring grades gain heated outside mirrors, automatic headlight control, 18-inch wheels, single-zone automatic climate control, rain-sensing windshield wipers, and heated front seats. The Grand Touring adds full leather seating surfaces, LED exterior lighting, imbedded GPS navigation, Bose audio system, power sunroof, lane-departure warning, automatic steering correction to keep you in your lane, and autonomous emergency braking that works at speeds beyond 19 mph. Also included on the Grand Touring is a head-up display on a small plastic panel that pops up from the top of the instrument cluster. It projects useful information, including vehicle speed, navigation directions, lane-departure alert, and even when a vehicle enters your blind spot. If you think the display is a distraction, you can turn it off, but the panel stays raised until you turn the vehicle off. CX-3 prices start reasonably, but higher-end models can reach the upper end of the competitive set. Base prices here are for front-wheel drive and include Mazda’s $995 destination fee. Add $1,400 to all grades for AWD. With front-wheel drive, the Sport model starts at $21,385, the Touring checks at $23,470, and the Grand Touring at $26,740. Various paint colors can add anywhere from $200-$595. Dealer-installed rear-obstacle detection is $500 while an SD Card to enable imbedded navigation on the Sport and Touring is $400. Other options are available in packages. Automatic climate control and rain-sensing wipers, along with the Grand Touring’s driver aids, LED lighting, and head-up display are included on the $1,100 Sport i-Activsense Package. Everything but climate control and rain-sensing wipers is included on the Touring i-Activsense Package, which costs $1,000. Tourings also offer a $1,400 Preferred Equipment Package that adds a power sunroof, Bose audio, satellite radio, and a cargo cover. Mazda is thoughtful enough to not require buyers to order this before being able to choose i-Activsense Package or vice-versa. The $710 Grand Touring Premium Package nets a heated steering wheel, power driver seat with memory positioning, and traffic sign recognition for the navigation system and head-up display. For $23,885, a Sport with AWD and i-Activsense Package is the best-value CX-3. A loaded Grand Touring approaches $30,000, which is far too expensive for a vehicle of this size and performance. Mazda’s approach to fuel efficiency relies on upgrading existing engine, transmission, and manufacturing technologies to reduce curb weights and reduce friction. All CX-3 models weight less than 3,000 pounds, which is an impressive feat of engineering given that the vehicle has to adhere to modern crash/safety standards. The results are EPA ratings near the top of the class. Models with front-wheel drive rate 29/34/31 mpg city/highway/combined while those with AWD rate 27/32/29. Our AWD Grand Touring test sample averaged an excellent 30.5 mpg over a weeklong evaluation that consisted primarily of suburban commuting and one day of extended highway travel. CX-3 uses regular-grade 87-octane gasoline. As CX-3 is not a high-volume vehicle for Mazda, don’t expect much in the way of significant changes for the next several model years. It’s possible the company could make the Grand Touring’s driver-assistance features standard on more models in 2020. Other than that, count on it standing pat until a new-generation model arrives in the 2021-2023 timeframe.